- Hello, dear Sophico, and our congratulations for being selected first ever Georgian representative at Eurovision 2007. What does this mean for you? - Thank you very much! That is a big honour for me to be the first Georgian participant on ESC. On one hand it is great as I am the first entry who is going to get Europe acquainted with my country Georgia. But on the other side it's an amazing responsibility to make the performance successful and loved by the audience of Eurovision. - Tell us how you were approached by Georgian television? What were your first thought at the moment you've learned about invitation? - In November 2006, the Georgian Public Broadcaster obtained the right for Georgia to participate in the Eurovision Song Contest 2007 and based on the survey conducted among population, nominated me as the contest participant. Of course it's very important for me not only like a singer but as for a person who loves her country and wants the best for all the people living in it. I am really happy that I have this chance - to represent Georgia before European audience. Music is one of those rare things that can unite people. My main goal is to get Europeans acquainted with my country through my music. - Unfortunately, only this year Georgia will have the first ESC broadcasting. Before that we could only watch Eurovision in recorded version. I had a chance to see some of them. This year is especially interesting for me, as I am participating myself. I have already seen some of the videos of this year's entries. I don't want to mention who are among my favourites but they definitely have very interesting songs. - You had performed 5 songs in your national selection. Was Visionary Dream best on your personal opinion, or you preferred some other song out of 5? - I can not sing the song if I do not like it. National Selection was a great chance to select the song which is liked the most. And I am glad that audience felt the same way. I am extremely happy that my preference and the thoughts of Georgian audience coincided :). Now you can welcome our "Visionary Dream"
- Was Visionary Dream written specially for Eurovision? - Yes, Visionary Dream is one of the songs from my new album. Recently I recorded an international album in the Livingston Studio, London. It has the same name as my ESC 2007 entry song and there are 8 songs recorded in total. The producers are Beka Japaridze and Achiko Guledani. Beka Japaridze is also the composer of the song "Visionary Dream" while lyrics were written by Bibi Kvachadze. - Can you introduce your team who is or will be working with you? - The team that is working with me is like an international family. There are people involved from Italy, Ukraine, UK and Georgia. They help me with the video, PR, stage performance, clothing and preparation in general. I enjoy working with these professional. For more detailed info please visit our official web-page www.eurovision-georgia.ge. - Why the title of the song was changed from "My Story" to "Visionary Dream"? How can you describe your song yourself, what is it about? - My story was the working title. Visionary Dream is the final one. Visionary Dream is about the combination of modern and past of Georgia. That is the song about every single Georgian no matter, where he lives either in the Georgia or abroad. It is also a song about every person in the world who has the visionary dream. All of us have our own desires and may this song remind them of what they are. - Are you planning to record other versions of the track, in other languages, or remixes? - At the moment we are not planning to record "Visionary Dream" in any other language. I recently finished working at my first international. It was a very important release for me. - You had very unusual performances at the Georgian selection. Do you plan to keep same show-line for Eurovision stage as well? 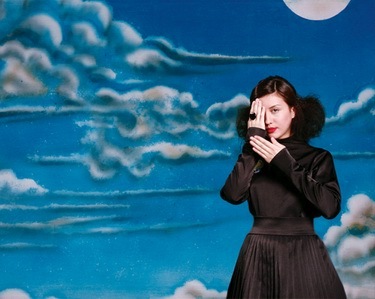 Your Visionary Dream presentation is usually compared to Bjork, what do you think about it? - Can you tell us more about your music video for contest entry? Where it was filmed, what is the main idea of it? - The aim of the video "Visionary Dream" was to introduce Georgia to European music community. We wanted to share a part of our culture and history, folklore and the beauty of my motherland. It was filmed in Georgia. Video is the result of the international team's work: American director and Georgian-Italian producing group. Post production of the video took place in Milan, Italy, at Filmmaster company. The director of the video is Kal Karman (www.kalkarman.com). We tried to combine history and traditions of my country, show interesting places and national dancing. - We made a decision not to have promo tours prior to Finland but pay more attention towards the preparations for the performance itself. However, we do pay particular attention towards media that is already very interested in Georgia and our song. It's very nice to receive the feedback and nice words from journalists and fans that send us letters. I thank them all. They give me even more strength to do my best at the contest. - Let's speak briefly on your career. We all remember you from successful appearance at Yurmala festival, what did it mean for you? - Yurmala festival was the first International Song Contest for me and I became a third place prize-winner. My music teacher thinks that I have a very special voice, calling it "mezzo-soprano of big range". ESC is a much higher step. I am working very hard to get prepared for my performance in Helsinki and it's a great pleasure to be doing something that you live for. - So you like taking part in singing competitions? Did you participate in any others? What do you consider as your career highlight besides Eurovision and Yurmala festival? - My first acquaintance with music was through the piano. Apart from playing the piano I learnt the oboe playing and participated in many local as well as international contests. In 2003, I became a prize-winner of the International Pianists Contest held in Tbilisi together with a friend of mine. Later I started singing and since that time I realized singing is my life. After TV Song Contest "Nutsas Skola", next was Yurmala, Latvia in 2006. It was the first International Song Contest for me. - What is your favourite music style to perform? - I like different music styles. Among my favourites is Steve Wonder. He is absolutely fantastic. I like to listen to classic rock, soul of 1970s... I like traditional Georgian music both to sing and to listen to. - Can you name us your favourite world singers? And your favourite singers from ex-USSR countries? - I dream to get to know Stevie Wonder and to sing a duet with him :). It is difficult to name my favourite singers from ex-USSR countries. Some of the singers and bands are very interesting. However, in general I preffer American, British, Russian, French, Italian or Georgian performers. - Do you follow music industry of Georgia? What do you think of the current Georgian music? - Music is a very big part of Georgia. You will rarely find a person who does not like to sing. Currently there are more and more new bands and singers rising on our stage. They have different styles. Some stay closer to traditional motives; some are more modern and similar to Europeans. This is really a matter of choice and how the artists feel about their music. Music industry in Georgia is developing and this is definitely a good sign. - The one, who searches, will always find! There are so many possibilities in life that we can not allow ourselves just sit and wait. Do not be afraid to turn your dreams into reality. - Thank you for the interview, good luck with your preparations and see you in Helsinki! - Thank you very much for your questions. And enjoy please the ESC 2007!!! - Добрый день, Софико! Наши поздравления с тем, что вы стали представителем Грузии на Евровидении 2007. Что этот факт значит для вас? - Большое спасибо! Для меня это большая честь стать первой представительницей Грузии на Евровидении. С одной стороны это великолепно, что я исполню первую песню, которая позволит Европе познакомиться с моей страной - Грузией. Но с другой стороны это и большая ответственность, ведь нам нужно сделать так, чтобы выступление стало успешным и понравилось зрителям конкурса. - Расскажите как вы получили предложение от Грузинского телевидения? Какая была ваша первая мысль, когда вам сообщили это предложение? - В ноябре 2006 года, Общественное Телевидение Грузии получило право принять участие в конкурсе Евровидение 2007, и я была выбрана представителем страны на основе социологического опроса населения. Это очень важно для меня не только как для певицы, но и как просто для человека, который любит свою страну и желает всего наилучшего людям, в ней живущим. Я очень рада тому, что мне предоставился этот шанс - представить Грузию перед Европейской аудиторией. Музыка - это одна из тех вещей, что может объединять людей. И моя главная задача познакомить европейцев с моей страной при помощи моей музыки. - В этом году Грузия будет транслировать Евровидение впервые. До этого мы могли смотреть его только в записи. Я видела несколько конкурсов, но этот год имеет для меня особенное значение, поскольку я сама принимаю участие в нем. Я уже посмотрела некоторые видео конкурсантов этого года. Я не буду называть своих фаворитов, но без сомнения есть много очень интересных песен. - На национальном отборе вы исполнили 5 песен. Была ли "Visionary Dream" вашим личным предпочтением, или вам больше нравилась какая-то другая песня? - Вообще, я не могу петь песню, если она мне не нравится. Национальный отбор был отличным шансом выбрать песню, которая мне нравится больше всего. И я рада, что аудитория почувствовала это. Я счастлива, что мои личные предпочтения и мнение грузинских зрителей совпали :) И сейчас вы тоже можете поприветствовать нашу "Visionary Dream". - Была ли "Visionary Dream" написана специально для Евровидения? - Это одна из песен для моего нового альбома. Недавно мы завершили его запись в студии Ливингстон в Лондоне. Он носит такое же название, как и моя конкурсная песня и в него вошли 8 композиций. Продюсеры - Бека Джапаридзе и Ачико Гуледани. Бека Джапаридзе также комозитор "Visionary Dream", текст к которой написан Биби Квачадзе. - Можете ли вы представить нам вашу команду? - Это интернациональная семья, в нее входят люди из Италии, Украины, Великобритании и Грузии. Они помогают мне с видео, PRом, подготовкйо сценического номера, костюмами и сценической подготовкой вообще. Мне очень нравится работать с этими профессионалами. Дополнительную информацию вы можете найти на нашем сайте www.eurovision-georgia.ge. - Почему название вашей песни сменилось с My Story на Visionary Dream? Как бы вы сами описали вашу песню, о чем она? - My Story было рабочим названием. Visionary Dream - окончательное. Visionary Dream - это песня о комбинации настоящего и прошлого Грузии. Это песня о любом грузине, вне зависимости живет ли он в Грузии или зарубежом. Это также песня о каждом человеке в мире у которого есть мечта. У каждого из нас есть свои желания и эта песня напоминает о них. - Вы планируете записать другие версии конкурсной песни, на других языках или ремиксы? - Нет, пока мы не планируем других версий. Я только что закончила работу над первым международным альбомом, это было очень важно для меня. - У вас было очень необычное выступление на грузинском отборе. Вы планируете сохранить то же шоу для сцены Евровидения? Также ваша песня часто сравнивается с Бьорк, что вы об этом думаете? - В Хельсинки мы покажем абсолютно другое шоу. Я пока хочу, чтобы это оставалось тайной. В нем будут совмещены современные и традиционные грузинские мотивы. Надеюсь вам понравится. Что же касается сравнения с Бьорк... По-правде говоря, я не вижу ничего общего... Нельзя судить обо мне слышав только одну мою песню. Поэтому, я надеюсь вы все послушаете мой новый альбом, который даст более полную картину о моей музыке (улыбается). - Можете рассказать о видеоклипе на вашу песню? Где он был снят, какова его основная идея? - Цель видеоклипа на песню "Visionary Dream" была представить Грузию Европейской публике. Мы хотели поделиться частью нашей культуры и истории, фольклора и красоты моей родины. Он был снят в Грузии, это результат работы нашей международной команды: режиссера из Америки и производственной группы из Грузии и Италии. Обработка видео прошла в Милане, в компании Filmmaster. Режиссер клипа - Кэл Карман (www.kalkarman.com). Мы пытались объединить в нем историю и традиции моей страны, показать интересные места и национальные танцы. - Мы приняли решение не проводить промо-тура, а сконцентрироваться на подготовке самого выступления. Однако, мы уделяем большое внимание общению со СМИ, которые уже сильно интересуются Грузией и нашей песней. Очень приятно получать отзывы от журналистов и фанатов, которые присылают нам письма. Я бы хотела их всех поблагодарить. Это прибавляет мне больше силы для выступления на конкурсе. - Давайте поговорим вкратце о вашей карьере. Мы все помнима вас по удачному выступлению на фестивале Новая Волна в Юрмале, что оно значило для вас? - Фестиваль в Юрмале стал моим первым международным конкурсом песни и я получила на нем третий приз. Мой преподаватель по вокалу, считает, что у меня очень особенный вокал, он называет его "меццо-сопрано широкого диапазона". Евровидение - это, конечно, более высокая ступень. Я очень серьезно работаю над моим выступлением и это большое удовольствие заниматься тем, ради чего ты живешь. - Вы любите принимать участие в песенных конкурсах? Вы участвовали в каких-то еще музыкальных соревнованиях? Что вы считаете основным моментом вашей карьеры помимо Евровидения и Юрмалы? - Мое первое знакомство с музыкой произошло посредством игры на фортепиано. Помимо него я еще изучала игру на габое и участвовала во многих местных и иностранных конкурсах. В 2003 году, я завоевала приз на международном конкурсе пианистов в Тбилиси. Позднее я начала петь и со временем поняла, что пени - это моя жизнь. После телевизионного конкурса "Nutsas Skola" следующим было выступление в Юрмале, Латвия в 2006 году. Это был первый международный конкурс для меня. - Я люблю разные. Мой любимый певец - Стиви Уандер, он абсолютно великолепен. Я люблю слушать классический рок и соул 70х. Также я люблю слушать и исполнять народную грузинскую музыку. - Можете назвать ваших любимых мировых исполнителей? И любимых исполнителей из стран СНГ? - Я мечтаю встретиться со Стиви Уандером и спеть с ним дуэтом :) Тяжело назвать любимых исполнителей из СНГ, но есть много интересных певцов и групп. В общем, я предпочитаю исполнителей из США, Британии, России, Франции, Италии или Грузии. - А что вы думаете о современной Грузинской музыке? - Музыка - это важная часть Грузии. Тяжело будет найти кого-то, кто не любит петь. В настоящее время на нашей сцене появляется все больше и больше новых исполнителей и групп, в различных стилях. Некоторые придерживаются традиционных мотивов, кто-то ориентируется на Европу. То есть есть музыка на разный вкус. Музыкальная индустрия Грузии развивается и это хороший знак. - Кто ищет, тот всегда найдет! В жизни так много возможностей, поэтому мы не должны просто сидеть и ждать. Давайте не будем бояться превращать наши мечты в реальность! - Спасибо за ваши вопросы. Надеюсь, вам понравится Евровидение 2007!! !